Wallet has funds spent in incomplete transactions? Before trying anything, you should check if Bittrex currently accepts incoming transactions. Siacoin is currently disabled on several exchanges. This out of the way, try sending smaller amounts of SC until you hit the limit. I don't know how to check your incomplete transactions, so that's what I'd do. Maybe somebody else cares enough for you to read the documentation and figure it out! 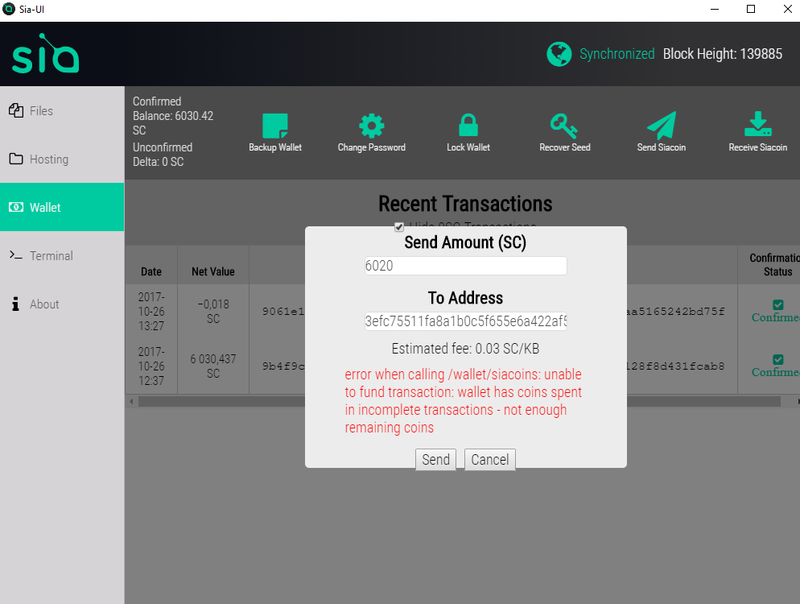 Your wallet are not fully synchronized and are stuck on block 139885. Therefore, you need to delete consensus.db and resync. @SandBlock Thank you! that worked. I assumed i was synced because it went from like 97% to 100% after having it open for a while.